Over the past seven years, the socioeconomic crisis that brought the citizens of democracy's birthplace to their knees has attracted the global media to the Greek capital. The crisis has, however, also put Athenians (back) in touch with their walls. From INO's murals – heavily inspired by the rich history of Greece – to Woozy's colourful street art, Athens has become a centre for graffiti – and even modern art, as manifested from the city's co-organisation of this year's Documenta (14th edition) exhibition. A crisis (derived from the Ancient Greek “κρίσις”, which means (1) judgement, (2) quarrel, (3) turning point) is by definition an unpleasant and dangerous situation, but one which also includes the element of opportunity. The Greek crisis has certainly been disastrous for the social tissue, but it has offered Greeks the inspiration and opportunity to create something new. And what is creation, if not art? And what is new, if not street art? Tourists visiting the Greek capital are often amazed by the walls of Athens. Full of spray, the Athenian walls inspire different emotions in passers-by. Rather ugly tags, sports teams' and political parties' slogans and symbols are one side of the coin, which certainly doesn't offer any particular beauty to Athens. 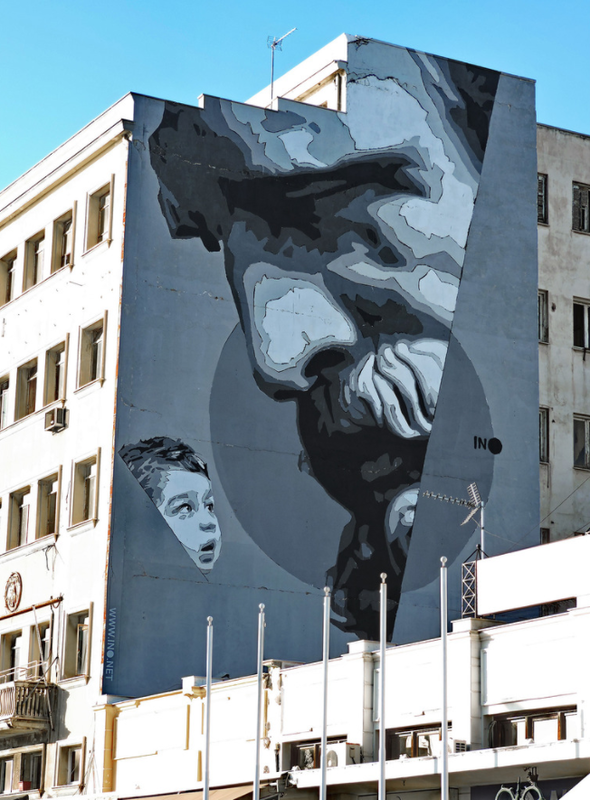 The other side of the coin is, however, equally present: beautiful murals and masterpieces of street art have become a main attraction for both Athenians and tourists. The city's street art – and even its ugly graffiti – depict a troubled society. In what is probably my favourite piece of street art in Athens, we see two hands that come together forming a praying gesture. The mural that decorates the side wall of hotel Vienna in Pireos Avenue, close to Omonia square in the centre of Athens, is a copy of German painter Albrecht Dürer’s piece “Praying Hands”, made in the beginning of the 16th century. However, while Dürer's work depicts the hands looking upwards, as a believer does when praying to God (mostly in Christianity), the artists of the Athens School of Fine Arts (ASKT) rotated the piece by 180 degrees: the praying hands point towards the ground. This modification from Dürer's original piece has been interpreted by some as expressing the idea that instead of Greeks praying to God, the present situation has brought God to pray for Greece and its people, who seem to have lost all hope. INO's murals have also drawn a lot of attention. Covering a tall building at the port of Piraeus (which, to be honest, is a different city, but is often counted as a part of Athens) is Democritus' head, together with that of a boy who is looking at the ancient philosopher with amazement on his face, while the bust of Solon in INO's piece “System of a Fraud” decorates another Athenian wall. Apart from painting figures from the classical times, INO also turns to modern and post-modern times, as seen from his piece “Access control”, in which a human eye is approached by a mysterious technological device, expressing the artist's concerns about mass surveillance and the future of society. Another Greek artist with a dynamic presence in Athens is Vassilis Hoursoglou, also known as Woozy. Woozy's vividly coloured art covers several Athenian walls. One of them is next to the Monastiraki metro station in central Athens, where a wall is decorated with his piece “The Colorful Warrior”. “Colorful tsunami” is also a beautiful piece, in which imaginary figures and weirdly shaped buildings are found facing the courtyard of a primary school. It offers a colourful note to the young students' daily routine. Finally, Athens has attracted the interest of foreign street artists. Banksy hasn't yet declared his presence in the Greek capital, but others like WD (Wild Drawings) and Oré have offered the Athenian walls a piece of their art. Notably, we see WD's depiction of one of the city's symbols, the owl, in “Knowledge speaks – Wisdom listens” in downtown Athens, as well as his eye-capturing “Capture” in the largely self-managed neighborhood of Exarcheia. WD's most powerful work on Athenian walls is probably “No Land for the Poor”, a piece dedicated to the poor and homeless of Athens and the rest of the world. French street artist Oré has also done some work in Athens, characterised by his signature open-mouthed dragons. The above are just a few artists who have decorated Athens’ walls. There are many others - whose names I have not mentioned - who have produced incredible pieces. There are others who have written powerful words on walls, which, despite being rather unpleasant to the eye, are worth a second look and a minute of thought at the very least. In times of crisis, art gives people a push and helps them think out of the box. It allows them to rediscover the things that matter in life. As Athens forms and transforms into a new city, I certainly hope that art will be ever-present: to remind us of the past, to counsel us for the future, to make us act today.